When I was very young, my mother would fill a ring mold with orange or green Jell-O and put it in the refrigerator. She would check its viscosity every few minutes until that moment arrived where the Libby’s fruit cocktail could be added without it sinking to the bottom. After dinner she would proudly display her colorful and quivering creation. My brother and I would locate the only two cherries that came in the Libby’s can to be sure we would get served that section. Sadly, soon after, molded food passed away leaving behind its exoskeletal remains to be used as decorations. For a while the copper kitchen molds were very fashionable as décor. They were seen hanging on the kitchen wall in the 60’s as likenesses of fish, pineapples, lobsters and just about every other food that could be pulverized and reshaped into a facsimile of itself. 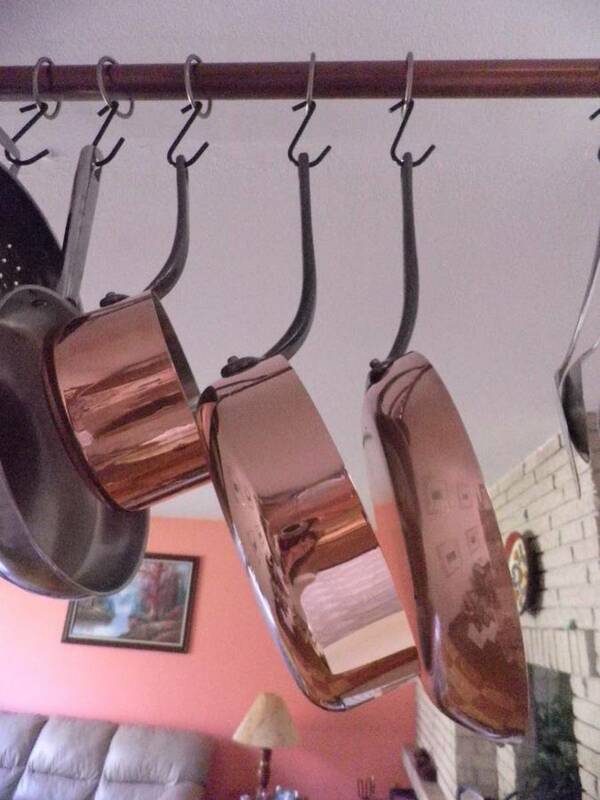 But shortly thereafter the copper molds began to disappear from American kitchens. Some of the less common tin lined models are sought after today by collectors. The common fish and pineapples were everywhere until the recent recession hit and the price of copper rose to a premium. Many copper molds are now recycled into copper wire. Prior to the Jell-O era of post WWII culinary simplicity, Americans and Europeans alike enjoyed the practice of making attractive, edible, displays by shaping food into almost anything. 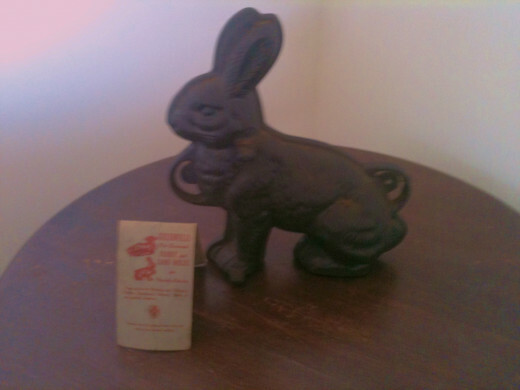 Easter would bring chocolate melted and poured into tin or aluminum rabbits and lambs. Butter was purchased in bulk, cut with a wire by the grocer and wrapped in brown paper. 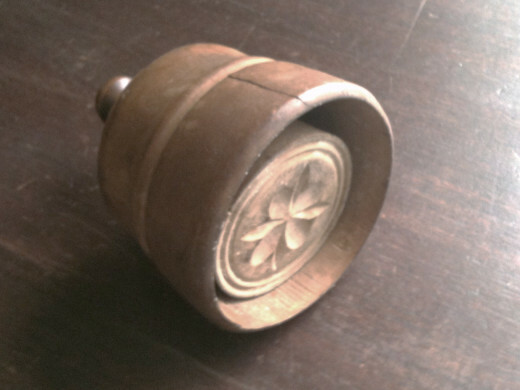 For the Sunday meal the butter would be pressed in a wooden mold with a plunger that left a relief flower or other design and placed on the table. Jelly was also molded as was aspic, a gelatinous combination of flavored broth and collagen from boiled bones. 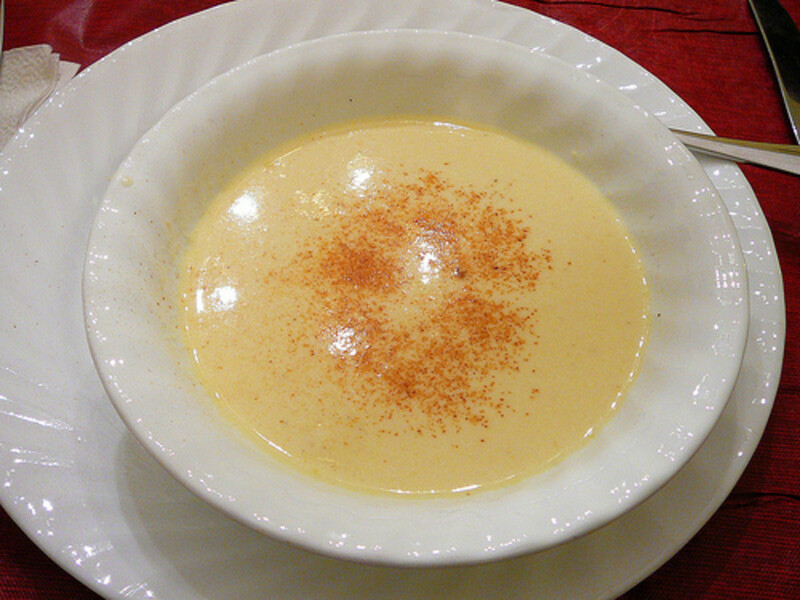 In the 19th century, Victorians served puddings around the holidays, in both England and in the US. These were not the pudding that the Jell-O and My-T-Fine companies produced in the mid 20th century but were a heavy, sweet, steamed combination of flour, fruit, butter and sugar or molasses and holiday spices. It was sort of a precursor to the fruit cake. 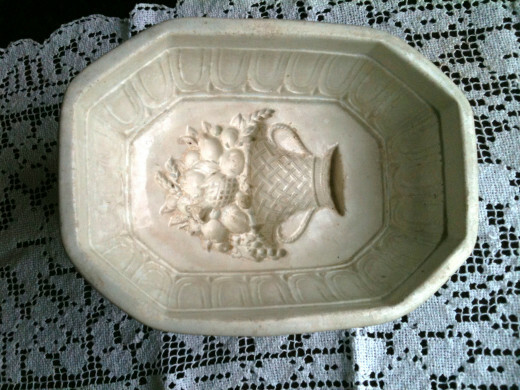 These would be steamed in the oven in ironstone pudding molds which had elaborate designs of fruit or flowers. For the more austere family the molds for these desserts were tin creations and often looked like ribbed melons. No matter what class of family you came from, as a child you would look forward to the holiday pudding. 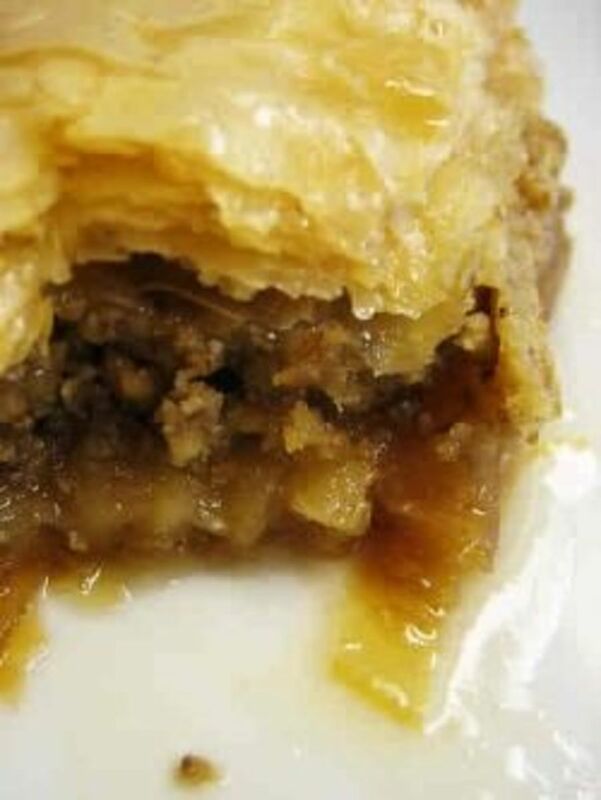 It was often served with hard sauce, a creamy and super sweet combination of butter and sugar. Contemporary recipes add brandy, vanilla, orange and even Grand Marnier. 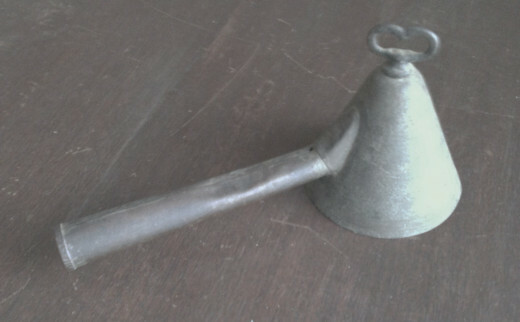 Even ice cream scoops were called molds and were cone shaped. 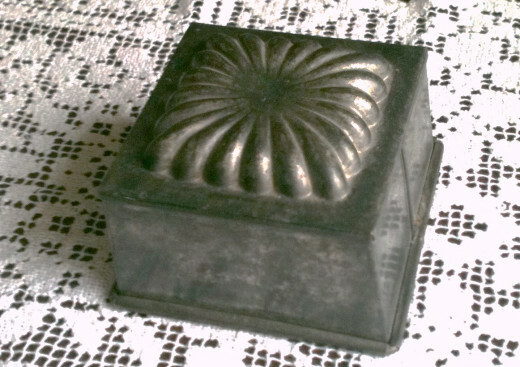 Vintage and antique molds fit into several categories and are collected today by many. There are the copper molds which date mostly from the 1950s but actually go back over 100 years. 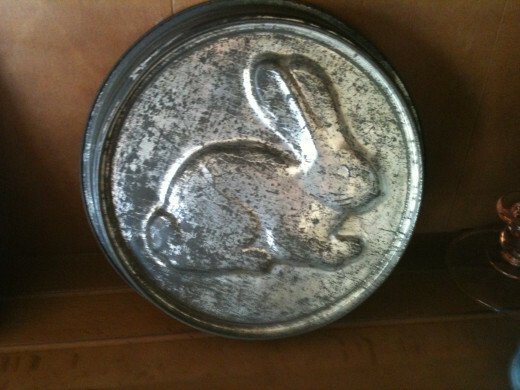 There are the tin molds from the late 19th and early 20th century that were used for butter, cakes, jelly, and aspic. The ironstone and pottery molds from 19th century England and America were used for your figgy pudding. Wooden molds from rural America for pressing butter and cookies are also highly collectible. One other form is the decorative glazed porcelain mold from the European porcelain factories. If you visualize a rustic French kitchen you should see a brightly colored floral mold hanging nearby. Today’s chefs have utilized the concept of molding food and put a quick and simple spin on it. Instead of serving rice or grains with a spoon, they will employ a quick form like a ramekin, cup or even a clean tuna can to create a dimensional presentation. McDonald's uses a mold for the eggs in a McMuffin. Will food molds ever shape our meals again or even our desserts? Absolutely they will, in fact they still do in the form of spring pans and Bundt pans which have survived for decades. 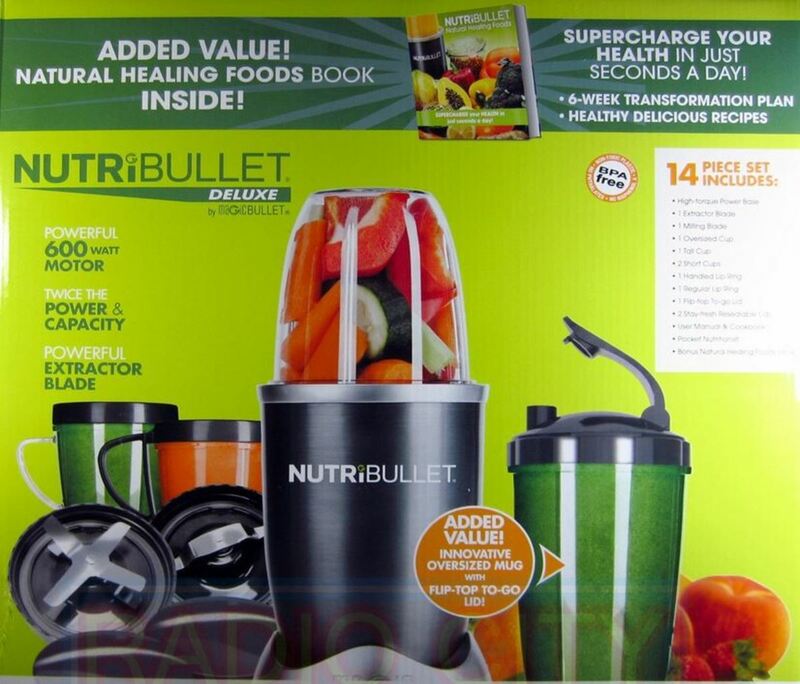 Food is man’s history and he will never cease to seek what was once in favor and combine it with what is current. Just as the crock pot and the fondue re-emerge every 20 years, the food mold will also make a comeback in one form or another.